Getting into Chaos before the most recent codex arrived didn’t offer a lot of interest in terms of the bigger warmachines. There were plenty of weird and warped engines of destruction lurking in the background of the artwork but unleashing them onto the tabletop wasn’t so easy. Before Forgefiends, Maulerfiends and Heldrakes all we really had were the same tanks as our loyalist brothers, but covered in spikes to make it clear we were the bad guys. This was, of course, excluding the Defiler, which stood out as a truly chaotic vehicle and the obvious centrepiece for any army of the Dark Gods. Perhaps because of this I harboured a long standing ambition to add one to my own Beasts of Ruin. I picked it up pre-assembled (and based coated) off Ebay so ended up doing very little conversion work on it. I’ve seen plenty of cracking conversions out there (and have a few ideas of my own) so might make a second some day but I wanted to have at least one of these classic monsters assembled ‘as nature intended’. As a side note, whilst buying it pre-assembled saved me having to build this monster myself it did leave me unable to paint it in sub-assemblies which would have made my life a lot easier. As I’ve mentioned before I can be a bit of a coward with big kits, preferring smaller infantry sized models, but I bit the bullet, faced my fears, and I’m rather pleased with what I came up with. At some point I’ll get some better pictures of him as he doesn’t look quite right in these (that face at the back looks pretty funky doesn’t it?) but for the meantime this finishes our post-Christmas look through old projects. Something new next week! Having finished off the Orks I wanted to step into the New Year (especially as its already the middle of January) by showing a few older miniatures that have been finished for a while now – thus getting them out of the way and letting us get stuck into the real meat of the new stuff. To get us started here’s the remainder of my Chaos Terminator squad (some of which have been shown previously – see here, here and here). This warped and degenerate fellow is clearly well on his way to becoming a spawn. I blame the unhealthy side-effects of standing too close to that icon of vengeance all the time. Alas poor Yarrick… Part of the reason it took me so long to get around to posting pictures of this squad is the trouble I had getting semi-decent pictures of this model. I enjoyed playing with the contradiction between his monstrous appearance and contemplative pose. I wonder what he sees in the skull of this fallen guardsman? His lost humanity or his lost weakness? Next we have this brutish individual, assembled out of a combination of Chaos Terminator, Possessed and Space Wolf Terminator parts. Finally here’s a group shot of the whole squad together. Those of you who are particularly observant or are big fans of counting will note that although I’ve claimed to have a full squad this picture shows only nine models. There is a tenth model but currently I’ve removed it from the squad – it’s one of my favourite models in the Beasts of Ruin but also one of the oldest. As such I feel it deserves not only an improved paintjob but a squad of its own to lead. Obviously that leads to a gap in the first squad which needs to be filled so expect to see more Chaos Terminators soon. At last – bloody minded stubbornness carries the day, the orky-revamp is done! Last on the tally of models in need of a touch up we have this squad of deffcopters. 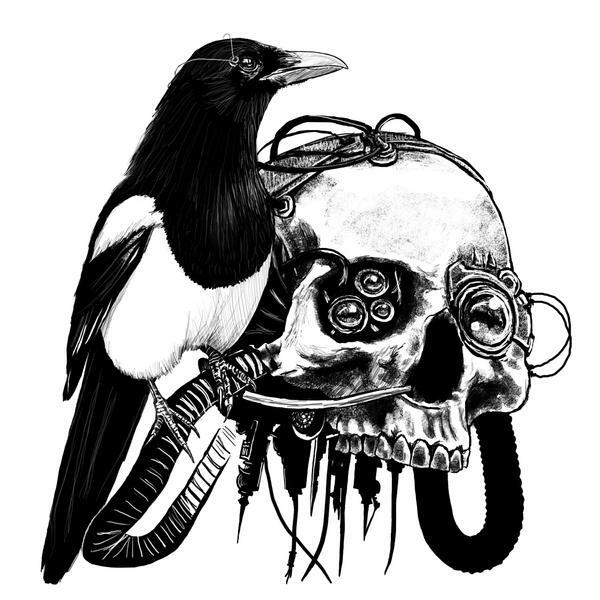 First up, the squadron leader – marked out with a suitably impressive trophy skull. To be honest deffcopters have never really grabbed me in the same way as other orky models, which may be the reason they’ve ended up left until last. Had they not come as part of the (otherwise excellent) Assault on Black Reach box I may never have ended up picking them up at all. Partly I think it’s the fact that they’re not the easiest models to convert, partly it’s that it isn’t easy to turn them into sub-assemblies so you end up painting a large and faintly intimidating lump all in one go. Having finished them I’m pleased enough with the results but I still can’t say they were my favourite bit of the project. Because they aren’t the easiest things to convert I tried to work in a few additional markings to differentiate each from the others. I do have a few unpainted Black Reach Deffcopters kicking around so, in spite of my complaining above, I may add a couple more to the squad, probably one with a big bomm and one with a buzzsaw. Anyway, with that the orky revamp is done (and everyone sick of greenskins can breathe a sigh of relief… for now). Next Chaos will get its moment in the sun, and I’ll be showing a few old projects which haven’t really seen the light of day yet. Until then, cheers and thanks for reading! Right, its 2015 – let’s get the last of these orks finished shall we? They may be the antithesis of good, healthy Orky culture (with their unfortunate tendency to obey orders and observe tactics) but Stormboys remain one of my all time favourite Ork units. (Possibly I’m ‘goin’ Ooman’ – who can say?) What’s not to love about Orks that dress smart, polish their boots, salute their betters and hurtle through the air on malfunctioning rocket packs? In the fiction it’s noted that no self-respecting Mek will work for the Stormboys (the association with organisation and discipline presumably being bad for their reputation with other potential customers). The result is that the rocket packs used by the Stormboys are usually pretty substandard, even for Orks. This model captures that nicely, he appears to have just shoved a bunch of missiles into a tube and strapped it to his back. I love all the little grots that come with this squad (as I may have mentioned before I reckon everything orky should have at least a few gretchin hanging on frantically). I especially like the expression of grim desperation on the face of this one, he appears to have realised that there’s no way of wriggling out this time and can only grit his teeth and hope for the best. It does make me wonder what he’s actually doing there though. Does he control the rocket somehow (in which case he’ll undoubtedly try to ram the ork into something solid before scurrying away) or has he merely been shoved in there by the ork in case he comes in handy when they get wherever they’re going? Speaking of gretchin hanging on, here’s the squad’s boss nob. A word of warning for those thinking of getting some Stormboys of their own, the whole squad falls over a lot – and the boss most of all. These models were not designed with staying upright on anything other than a shelf in mind (and even then it had better be securely cemented into the floor). I recommend sticking a small weight onto their bases. If I remember correctly one is technically not supposed to put any item of currency out of use permanently but I’ve found blue-tacking a penny onto each base is a big help (not to mention cheap) and they can easily be removed if required (i.e. when HM Customs and Revenue reads this and decides to mount an early morning raid on my house…). When I finally get my bum into gear on my Warptalons and Raptors I’ll probably use the same trick. Anyway, last of all here’s a cheesy groupshot. ZOOOOOM-DAKA-DAKA-DAKA!! Just the deffcopters to go! Today saw the new Skaven Verminlord model go up for pre-order as part of the next phase of the Warhammer End Times, so I’ll be continuing my occasional series of speculations on what I’d do with the kit if time and money allowed. Obviously as a Skaven fan I’m very curious about what new models the verminous masses will be getting as part of the great plan to bring civilisation to its knees (and stealing the plastic intended for Elf models was cunning, rat-servants, yes-yes!). However I’m not quite ready to retreat back to my underground nest and start work on a diabolical, if poorly designed, weapon of mass(self)-destruction. For the moment my evil plotting remains very much focussed on the Dark Millennium, and specifically the Ruinous Powers. The irony is that many people, myself included, have been moaning on about the lack of decent (official) models for the Great Daemons for ages. The Great Unclean One is basically the best of a bad bunch, Kairos Fateweaver is fairly solid (but doesn’t look that easy to convert into a single headed Lord of Change), the Forgeworld models are pretty good but horribly expensive and the rest are various shades of naff, through to just plain awful. Now I’m sure this is a rant you’ve heard before, many, many times, but try to stick with me because the twist is only just revealing itself as the fifth Chaos god plays his hand. The Great Horned Rat may lurk in the shadow of the Four but he’s still the one who gets a plastic Greater Daemon (because by any other name that’s exactly what the Verminlord is) ahead of the rest. 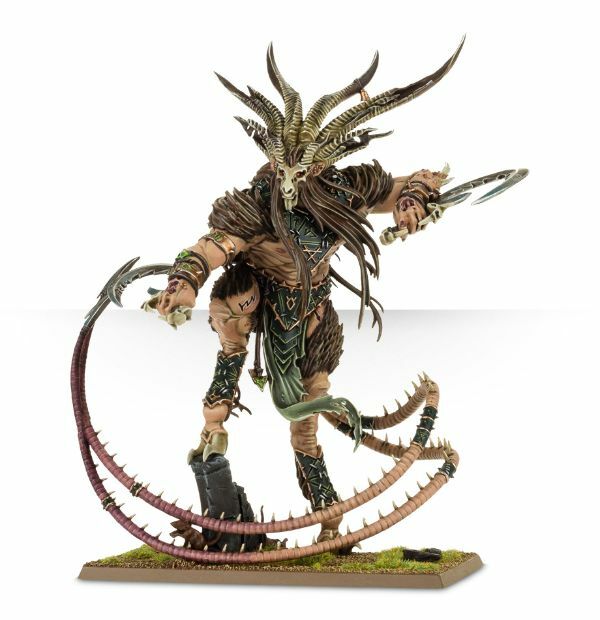 The more I look at the Verminlord the more its Pan-ish qualities reveal themselves. With those sweeping horns, goat-like face and hooves it wouldn’t look out of place at the head of an army of Beastmen (minus the ratty tail perhaps). Obviously the armour and weapons are very obviously Skaven (all those runes scratched everywhere for one thing). Greenstuff over them however and replace the tabard and staff with those from the Tree Man Ancient and you have the makings of an untamed forest guardian, a Lord of the Woods that any wood elf would follow in these uncertain times for Athel Loren. I see the makings of a great ‘counts as’ Durthu – and one that sits a little better with my image of the wood elves than the official version. (Somewhere an elf player’s head just exploded. ‘They deny us new miniatures and then he suggests we make do with re-working a giant rat? Damn him and his pompous blog!’). Another possibility, and much though I love the idea of a Wood Elf Forest King this one ties in more closely with my current projects, is the Keeper of Secrets. Of the official Greater Daemons the Slaaneshi model is arguably the worst (although there’s some stiff competition from the Bloodthirster). Why are its proportions so uncomfortably weird (and not in a good way)? How do those spindly legs carry it around? Who thought either of those heads were a good idea? Why is he doing some kind of weird gang signs? The mind boggles. Already I’ve seen several people suggesting that this is the way forwards but making a Keeper of Secrets from this bad boy won’t be straightforward; the tail will have to go (or perhaps be turned into some kind of whip), he’s got two arms fewer than the official model and you’d need to find a sword from somewhere (that shouldn’t be too difficult). He’s also a bit on the hairy side for a Keeper of Secrets. And who painted the Warpseer blond? Really with those locks and muscles I can’t look at him without wanting to break out some 80’s power metal as this comparison shows (for those of your who’re uncertain the Skaven is the one on the left). Anyway I should add I’m not likely to take this one on myself any time soon, as quite a few other projects are on my agenda for the coming months. However I’m looking forward to seeing what people come up with – especially as quite a bit of creativity will be called for (compared to Ghurk Glott for instance, who makes a damn fine Great Unclean One straight out of the box). All in all it’s making me start to wonder if Games Workshop are sneaking the plastic Greater Daemons out in disguise. We already have the Ghorgon which, with the addition of some wings and a suitably fearsome axe creates a highly impressive Bloodthirster (take a look at this one for instance). It makes you wonder if the next End Times release will include a giant bird man. Here’s hoping! Disclaimer: None of these pictures are mine, credit for them belongs to their respective owners. Obviously. And whilst I’m about it I apologise for trying to get a cheap laugh out of the Kings of Metal by comparing them to a silly blond rat.